This documentary was probably originally a one-hour TV special. In this DVD release, The Great American Western Volume 20, it is one of 4 titles. The title in this package is given as Great American West (both on the DVD case and in the DVD menu) but when you actually it, it is titled "The American West of John Ford". What we basically have here is famed western director John Ford (the only director ever to win 4 Academy Awards for directing) along with three of his most famous leading men (John Wayne, James Stewart and Henry Fonda) gathering together for some great times reminisching about Ford's career. Stewart and Fonda each get to host and narrate a segment...John Wayne, being the mega-star that he is, gets to host two segments. Wayne's segments were filmed at the famed Monument Valley were many of Ford's westerns were filmed. Among the films discussed in this documentary (and featuring clips of) are Stagecoach, The Searchers, Fort Apache, Rio Grande, The Man Who Shot Liberty Valance, She Wore A Yellow Ribbon, My Darling Clementine, and Cheyenne Autumn. I had an enjoyable time watching this documentary, especially the segments including John Wayne. The quality of the picture and sound was decent enough for me to enjoy it. This single-disc release also includes 3 western feature films...White Comanche starring William Shatner in a dual role, Kentucky Rifle, and Bells of San Angelo which stars Roy Rogers and Dale Evans. The Roy Rogers film is in black and white, the others are in color. Unfortunately, the picture quality of the feature films is not as good as the documentary...I can't recommend those but since you can probably pick this title up for about $5 (if not less), it's worth it for the documentary alone. This movie is about a novelist (Luke Wilson) who has to write a novel in 30 days to get money to pay some gangsters or they will kill him. He hires a stenographer (Kate Hudson) who types while he dictates. We see them in key roles as we see scenes from his novel acted out...and she interrupts him from time to time arguing about what's going on and the characters' motivation and such. I know some have been less than crazy about this movie (going as far as to call it boring) but I rather liked it. Sure, there's nothing really earth shattering in this movie but not every movie has to be non-stop action. I did find myself laughing at different parts of the movie and sometimes that's enough. I won't need to pull this movie out for annual viewings but I am not sorry for the one time I have watched it so far. Glad it found a good home Roger! Voices: Kevin Conroy, Kimberly Brooks, Hector Elizondo, Kevin Michael Richardson, Kelly Ripa, Kyra Sedgwick, David Ogden Stiers, Bob Hastings, Efram Zimbalist Jr. 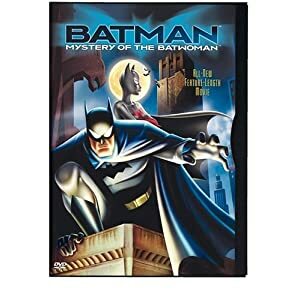 In this animated direct-to-DVD movie, a new costumed vigilante is in town...Batwoman. She is particularly bent on destroying the crime alliance of Rupert Thorne and The Penguin...who are soon joined by the behemoth known as Bane. Batman tries to keep the peace and also tries to solve the mystery of just who is this Batwoman anyway? There are several women on the scene, any of which could be the mysterious crimefighter. This animated feature was made by some of the same people who worked on the Batman animated series, though not all of them (no Bruce Timm on this project, for instance). The movie is 75 minutes long so there's no time for slow boring passages. It's a fast-moving, slightly less dark adventure than many of the episodes of the series it is based on. And, surprise surprise, Bruce Wayne even winds up with a girl at the end! Woo-hoo! I would definitely recommend this for any wanting a good animated Batman adventure. The DVD release has several extras. There is a short original Batman adventure (about 5 or 6 minutes long) titled "Chase Me" where Batman is chasing Catwoman...there's no dialogue or sound effects in this adventure...the soundtrack is comprised solely of a musical score. There is a couple behind-the-scenes featurettes, one where several involved with the main film talk about the film and their thoughts on how they approached it and Andrea Romano discusses how a specific scene is approched, from script to finished product. And there are character bios...but if you get this, don't check those out until after watching the main film unless you want the mystery of who Batwoman is to be ruined for you! I enjoyed these extras, too...it makes me want to place an order right away for some other Batman animated adventures I don't have yet! 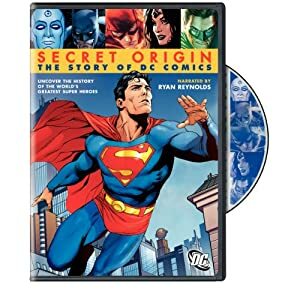 I just got done watching Secret Origin: The Story of DC Comics. It is 90 minutes and narrated by Ryan Reynolds, who happens to play Green Lantern in the movie currently in production. I was glad that the documentary was not taken over by discussion of the various TV and movie incarnations of the DC super-heroes, though there was some of that, of course. For the most part, though, they concentrated on the comics. Among the people we got to see interviewed were Julius Schwartz, Marv Wolfman (I was shocked at how he looks now! ), Len Wein, Neil Gaiman, Grant Morrison, Alan Moore, Denny O'Neill, Louise and Walter Simonson, Mike Carlin, Paul Levitz, Karen Berger and others. They even had some older pieces where we got to see and hear Jerry Siegel & Joe Shuster (co-creators of Superman) and Bob Kane (creator of Batman). While I enjoyed it...I would have liked even more. I wish they could give us more insight into the Golden Age as they mostly concentrated on the big 3 of that era: Superman, Batman and Wonder Woman. But I did enjoy what we got. I may have to look now for other comic book documentaries. I should get hold of a copy of Comic Book Confidential...especially since I was still reading comics back at the time that was originally done.